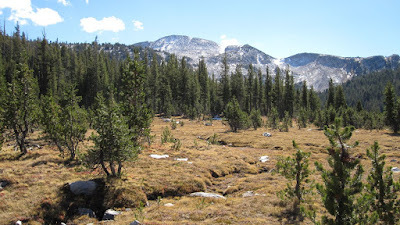 Now is our favorite time to get out into the wilderness. School has started for everyone, and there are fewer people on the trails, fewer people in the campgrounds, and fewer people on the road. Yes, it is certainly drier now, so there isn't a much water readily available , but that also means that there are almost no mosquitoes at all. That's a trade-off we'll take any time. Of course, you'll want to watch the weather carefully. If a storm blows in after Labor Day, it can frequently mean snow in the High Country, and that's something that you'll at least want to be prepared for. Please remember that snow not only makes it colder---it also obscures many parts of a trail. So if you aren't comfortable with a bit of point to point navigation, stay close to known landmarks. 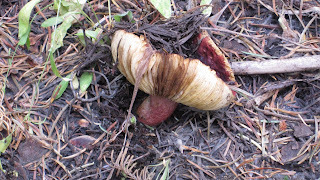 And this is the time to see all the wonderful fungi that pops up out of the ground after the first rain...and more. Still, with all those caveats, it's a wonderful time to get out onto the trail. And we hope you do.